If you’re looking for kitchen remodeling options to make the room more efficient and functional, you should take a careful look at the kitchen layout. The layout determines how convenient and safe it will be for you to work in the kitchen. In terms of kitchen layout, you have two options: triangle and zones. Read on to learn more about them. The kitchen triangle’s history goes back to the 1940s. Around that time, kitchens were small and kitchen appliances were huge. Before that time, kitchens were simply an area exclusive to preparing and cooking food. To maximize the small space, the triangle connected three primary kitchen elements: the range, sink and refrigerator. For the kitchen triangle to be effective, the distance between the range, sink and refrigerator should be no less than four feet to avoid being cramped, and no more than nine feet to make sure that moving around remains convenient. Zoning is considered the evolution of the traditional kitchen triangle. When kitchen appliances started to become smaller and sleeker, kitchens became more spacious as a result. More homeowners also welcomed the idea of multi-purpose and open layout kitchens. A zoned kitchen is divided into zones or areas. There is the cooking area, preparation area, washing area and storage area, among others. Which Layout Makes Sense for Your Home? Floor space. If you have a small kitchen, the triangle will prove more efficient. Meanwhile, you can maximize a bigger kitchen when you divide it into zones. Number of people using the kitchen. If only one person in the household typically uses the kitchen at one time, the kitchen triangle may be suitable. However, if you expect two or more people to work in the kitchen, zoning may be smarter. Overall home layout. If your kitchen is separated by a wall and has floor space, then the triangle will make more sense. 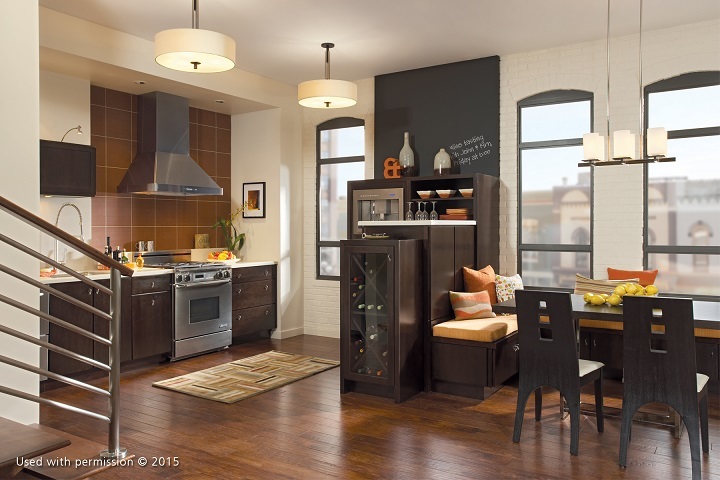 If you have an open kitchen layout, then you’re better off opting for kitchen zones. Get in Touch with a Kitchen Remodeling Pro! As your trusted team of kitchen remodeling contractors, DreamMaker Bath & Kitchen of Central Texas can help you decide which kitchen layout is best for your home. Call us today at (254) 262-0087 or submit our contact form to schedule a consultation.